Haq's Musings: Silicon Valley Launch of "Eating Grass- The Making of the Pakistani Bomb"
Silicon Valley Launch of "Eating Grass- The Making of the Pakistani Bomb"
Unlike most western accounts of Pakistani nuclear program which begin and end with A.Q. 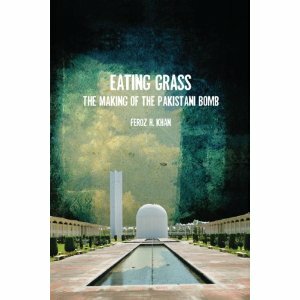 Khan's network, Brig Feroz H. Khan's scholarly work "Eating Grass" offers a very comprehensive story of the "Making of The Pakistani Bomb". Feroz Khan takes the reader through the interdisciplinary nature and the inherent complexity of what it takes to develop, build and operationalize a nuclear weapons arsenal. The standard Western and Indian narrative has us believe that A.Q. Khan stole the uranium enrichment technology and built the Pakistani atom bomb, and then proliferated it to Iran, Libya and North Korea. To put it perspective, Feroz Khan explains that it takes at least 500 scientists and 1300 engineers with relevant training and skills to have a nuclear weapons program, according to a 1968 UN study. In a piece titled "Laser Isotope Enrichment-a new dimension to the nth country problem? ", Dr. Robert L. Bledsoe writes as follows: "a United Nations study conservatively estimates that at least 500 scientists and 1300 engineers are needed to develop and maintain warhead production facilities, and an additional 19,000 personnel (more than 5000 of them scientists and engineers) are required to produce delivery vehicles of the intermediate ballistic missile variety". Khan's book was launched in Silicon Valley at the Fremont Marriott yesterday, with about 100 invited guests, including this blogger, in attendance. The author was introduced by Ms. Sabahat Rafique, a prominent local Pakistani-American. The author, currently a lecturer at Naval Postgraduate School in Monterey, spoke briefly about the extensive research he undertook to write the book. He was joined by Prof Rifaat Husain, visiting scholar at Stanford University's Center for International Security and Cooperation, to answer questions. "Eating grass", published by Stanford University Press, traces the origins of Pakistani nuclear program to the work of Dr. Rafi Mohammad Chaudhry in 1950s and of Dr. Ishrat Husain Usmani in 1960s, both of whom were graduates of Aligarh Muslim University. Dr. Chaudhry did his doctoral research in physics under the supervision of the famous British physicist Ernest Rutherford at Cambridge and Dr. Usmani got his Ph.D. in physics at Imperial College, University of London, with Nobel Laureate Professor P.M.S. Blackett as his adviser. Along with Pakistani Nobel Laureate Dr. Abdus Salam, Chaudhry and Usmani built laboratories and academic institutions and inspired generations of Pakistanis to study subjects in STEM (Science, Technology, Engineering and Mathematics) fields to produce the scientific and engineering talent for the young nation beginning in 1950s and 1960s. Darra Adam Khel cottage industry making copies of sophisticated firearms is a testament to the reverse engineering prowess in Pakistan. Faced with multiple layers of sanctions, Pakistanis have now developed industrial scale reverse engineering capabilities. The best example of it is Pakistan's cruise missile Babur which was derived from US Tomahawk cruise missile. Some of these Tomahawk missiles landed intact in Pakistani territory when Clinton ordered cruise missile attack on Bin Laden in August 1998 in response to USS Cole attack by Al Qaida. The title of the book "Eating Grass" alludes to Zulfikar Ali Bhutto's famous quote "we will eat grass, even go hungry, but we will get one of our own (atom bomb). We have no other choice". Khan goes beyond the quote to highlight Bhutto's substantial role in promoting Pakistan's nuclear program in 1960s. After India's humiliating defeat at the hands of the Chinese in 1962 and the Chinese nuclear test in 1964, Bhutto realized that India, too, would follow suit with a bomb of its own. He started lobbying with President Ayub Khan to start the bomb effort as early as mid 1960s. Ayub and most of his cabinet dismissed the idea but Bhutto remained committed to it and started taking modest steps toward building the scientific capability for it. As part of this effort, Pakistan Atomic Energy Commission (PAEC) and Pakistan's Institute of Nuclear Science and Technology (PINSTECH) were established in 1960s under the leadership of Dr. I.H. Usmani. These were followed by the construction of Karachi Nuclear Power Plant (KANUPP) in 1970s. These institutions became training grounds for thousands of engineers and scientists in Pakistan in the field of nuclear science and technology. It was Pakistan's dismemberment after a humiliating defeat in India-Pakistan war of 1971 and India's first successful nuclear test in 1974 that, according to Khan, strengthened Pakistanis' resolve to weaponize the country's nuclear program. This new resolve gave strong impetus to expanding research and development activities and covert acquisition of a range of components necessary to build indigenous capability to produce nuclear warheads and delivery mechanisms. This was done in the face of strict international controls mandated by NPT and MTCR to prevent proliferation of nuclear and missile technologies. Parallel covert efforts started with the establishment of a uranium enrichment facility at Kahuta which was headed by A.Q. Khan. A.Q Khan, a graduate of Karachi University, had been working on uranium enrichment in Europe for many years. He had the knowledge and the experience. He also had a wide range of contacts he had developed over the years while working at URENCO in Europe which he used to establish a procurement network. A.Q. Khan succeeded in acquiring the components and building thousands of gas centrifuges to produce highly enriched uranium (HEU) well ahead of a similar plutonium (Pu) reprocessing program underway at PAEC. The book explains that HEU from A.Q. Khan's Research Lab (KRL) was essential but alone was not enough to make a bomb. It was PAEC that did the R&D to metalize UF6 into bomb core, and designed and built trigger mechanism with specialized explosives, lenses and detonators. It also required lots of cold testing to test the bomb design before conducting hot tests. Pakistan finally decided to go ahead with its atomic weapons tests in response to India's tests in May, 1998. It took only two weeks for Pakistan to do so after the Indian tests. Pakistan's then-prime minister Nawaz Sharif ordered the tests in the face of intense international pressure, particularly from the US President Bill Clinton who made multiple phone calls to Sharif asking him to refrain from it.The tests were followed by severe international sanctions led by the United States against Pakistan. In addition to the work on the bomb, both PAEC and KRL labs also pursued development of reliable delivery vehicles for nuclear warheads. While PAEC worked on solid fuel rockets based on Chinese M-11 design, KRL focused on liquid-fueled variety based North Korean Nodong, writes Khan in "Eating Grass". Khan says Pakistanis have also reverse engineered American Tomahawk cruise missile as part of their efforts to add stealth capability to hit targets deep inside India from air, land and sea. Khan goes into the efforts made by Pakistan under President Musharraf since 2000 to put in place robust security of its nuclear assets and sophisticated command and control structures. A separate strategic command has been established to operationalize its nuclear weapons capability. And it is continuing to develop with changing needs. Khan says in the book that there are eight Indian reactors exempted by US-India nuclear deal from IAEA safeguards leaving India free to process and accumulate 500 Kg weapons-grade plutonium per year. In addition, India is rapidly expanding its HEU production for its nuclear submarine by adding thousands of centrifuges. Pakistan has responded by increasing its plutonium production at its indigenously built Khushab reactor complex which is not covered by IAEA safeguards, according to Khan. KRL is also continuing to produce about 100 Kg per year HEU with a new generation of P-3 and P-4 centrifuges at much higher separation rate. Khan does not gloss over the severe damage done to Pakistan by AQ Khan's proliferation network and concerns raised by a meeting of Pakistani nuclear scientists Sultan Bashiruddin Mehmood and Abdul Majeed with Osama Bin Laden. He discusses at length how AQ Khan turned his procurement network into a proliferation network for personal profit. Musharraf saw the AQ Khan's proliferation as the "most difficult thing to deal with". The author quotes Musharraf as saying, "(T)he public image of A.Q. Khan was that of a legend and father of the bomb. He certainly was a hero for his role and contribution to the nuclear program, but at the same time no other person brought so much harm to the nuclear program than him". As to Mehmood and Majeed, Khan says that they designed Khushab reactors. Their expertise was in reactor design, not bomb-making, and they couldn't have helped Al Qaeda acquire a bomb even if they wanted to. Nonetheless, they reinforced international suspicions about Pakistan's primarily defensive nuclear efforts. As expected, the main criticism of the book has come from Indian reviewers. In a 500-page book, Indian critics have singled out a one-line citation by the author that on December 16, 1971, Prime Minister Indira Gandhi stood before the Indian Parliament and, amid a thunderous standing ovation, stated that India had “avenged several centuries of Hindu humiliation at the hands of Mughal emperors and sultans”. Khan has cited his reference for it as follows: V. Longer, The Defence and Foreign Policy of India (New Delhi: Sterling Publishers, 1998), 205. Cited in Sattar, Pakistan's Foreign Policy 1947-2005, 119. Brig Feroz Khan concludes his book on a somber note by mentioning "massive corruption" and "stagflation" in the country he served. "Perhaps it never crossed Zulfikar Ali Bhutto's mind that his words (eat grass...even go hungry) would become a self-fulfilling prophesy." "Eating Grass-The Making of the Pakistani Bomb"-- Riaz Haq Talks With Author Brig Firoz Khan from WBT TV on Vimeo. "my contribution to 80386 program.! AQ Khan is the system architect of the Pakistani bomb. A system architect is one who makes things happen, using a number of personnel working on hardware and software, QA people, test engineers and the like. In the end, it is the system architect's vision that the credit goes to. Yes, you give credit to all those who lent hand, but then again, those people have chosen to, and are destined to, do only one thing - lend a hand. There is a lot wrong in the book, but you should have done your own research and then you would have been able to publish an "authentic" review of an unauthentic book. I guess that only the Bay Area elite were invited! Ras: "I guess that only the Bay Area elite were invited!" I was probably the only exception to the "Bay Area elite" at the event. Not many in the Military liked AQK or started to "disown" him after the house arrest. These people are the majority of the ones being interviewed in the book. Amazing how this review omitted the names of Mr. Munir Ahmad Khan--Chairman PAEC 1972-1991--who headed 20 labs the projects of the entire fuel cycle and the bomb program--each one the size of KRL, and his successor Dr. Ishfaq Ahmad along with Dr. Samar Mubarakmand who built up the NDC/NESCOM and the missile program even though their respective roles have been dealt with at length in the book. SUMMARY: We don't have a SINGLE electricity-producing reactor that was made locally and isn't under IAEA safeguards. Not even one. And these 300MWe (CNP-300) that our BFF China has so generously grandfathered past the NSG are actually circa 1950s Westinghouse PWR designs. The only reason China built these for us is because they STOPPED building them in China 10 years ago because they were completely obsolete in terms of efficiency, cost, safety and reliability. The fact that we need China to build a low-power 300 MW reactor with a obsolete 1950s design SHOULD TELL US that we do not have the capacity to build anything beyond the rudimentary 15MWe university-level PHWR plants we have at Khushab. So all these dreams of "indigenous" production of 8000MWe is just fantasy. The only way we will EVER get to 8000MWe is (a) if China builds lots of reactors for us by ignoring the NSG, or, (b) if the NSG gives us a waiver so that we can buy (or borrow) the lastest, more efficient and most safe technologies from all suppliers. With one of these two things happening, we can FORGET about Nuclear electricity. Yes, we will have plenty of HEU and WGP bombs, but we won't have a lot of nuclear-generated electricity. And, as I mentioned elsewhere, we will just be watching from the sidelines as the whole world helps Bangladesh march forward towards its goal of 10,000 MWe from Nuclear Power by 2030. Is it not ironic that Bangladesh will wind up having more Nuclear Electricity that we do, even though we were the ones with the early Nuclear Program and the alphabet soup of agencies? PS: For the record, we should note that the Indians are already building 700MWe PHWRs and even 500MWe Complex FBRs (non-IAEA) by themselves right now. They are relying on foreigners only for the latest 1,000-1,600 MWe designs (VVER-1200, EPWR-1200, AP-1500 etc). Many intellectuals believe that internal problems and geopolitical upheavals have taken Pakistan to the brink. But according to Russian scholar VY Belokrenitsky, who has spent decades studying its history, the country remains as strong as any other. “If you look at all that has happened in the past, Pakistan’s is a success story,” he said during the launch of the book ‘A Political History of Pakistan: 1947 to 2007’ on day two of the fourth Karachi Literature Festival on February 16. He has co-authored the book with compatriot VN Moskalenko. The book has been divided into seven parts which trace the country’s history from the pre-partition era to the tumultuous end of General (retd) Pervez Musharraf’s government. Belokrenitsky said the book has been written from the Russian perspective, with a particular emphasis on the relationship between the two countries. However, it also deals with prominent political developments. He said that years 2013 and 2014 can be a turning point for Pakistan as foreign troops are expected to exit Afghanistan. Columnist Humayun Gauhar also spoke at the event. Technical advance -- according to Eric Hobsbawm's The Age of Extremes -- had three significant impacts. First, it transformed everyday life in the affluent world: before 1945 most families in the "developed world" would not have had a refrigerator, a television, vinyl records, tape cassettes, transistor radios, digital watches, pocket calculators, video equipment or general access to the birth control pill. Second, disproportionately more money was now spent on research and development (R&D) than ever before, thus bolstering the dominance of the wealthy regions of the world over the poor. By the 1970s the affluent countries had over 1000 scientists and engineers for every million people in population while Pakistan averaged around 60 and Kenya around 30. Third, and most importantly for the period after the 1970s, the new technologies were capital-intensive and eventually labour-replacing: machines would build automobiles, computers would manage trains, and money would be deposited, invested and withdrawn without the intervention of tellers. The significance of technological progress was that employees in the rich countries -- other than scientists and engineers -- would eventually become more crucial to the success of the economy as consumers rather than as producers. Technology's great leap forward -- and our deification of it -- continues unabated: it is now enabling some corporations to "in-source" production. Historically, technology facilitated companies' abilities, especially those from the United States, to "out-source" production, though not necessarily co-ordination, to other parts of the world thus substantially reducing the costs of labour. Today, because of computerization and other factors, some companies are choosing to return some of their manufacturing processes back to the United States. Tyler Cowen notes in the May/June 2012 issue of The American Interest that "in a manufacturing survey from November 2011, almost one-fifth of North American manufacturers claimed to have brought production back from a 'low-cost' country to North America." While it would be understandable for workers to stand up and cheer at the thought of companies returning to their country, their elation would be short-lived. Artificial intelligence and computing power are taking over manufacturing, thus transforming factories into quiet, empty spaces whose only sound is the hum of a machine. ^^RH Quotes Someone: "By the 1970s the affluent countries had over 1000 scientists and engineers for every million people in population while Pakistan averaged around 60 and Kenya around 30. " Do you have the current figures? How has the situation changed since the 1970s? How many "scientists and engineers per million people" do we have now? How does this compare to equivalent countries like Kenya & Bangladesh? How does it compare to the West (US/EU)? HWJ: "Do you have the current figures? How has the situation changed since the 1970s? How many "scientists and engineers per million people" do we have now?" I don't have the exact data on the number of Pakistani engineers and scientists per million today but my guess is that it's several times higher now. A good indicator is the work of Barro & Lee. 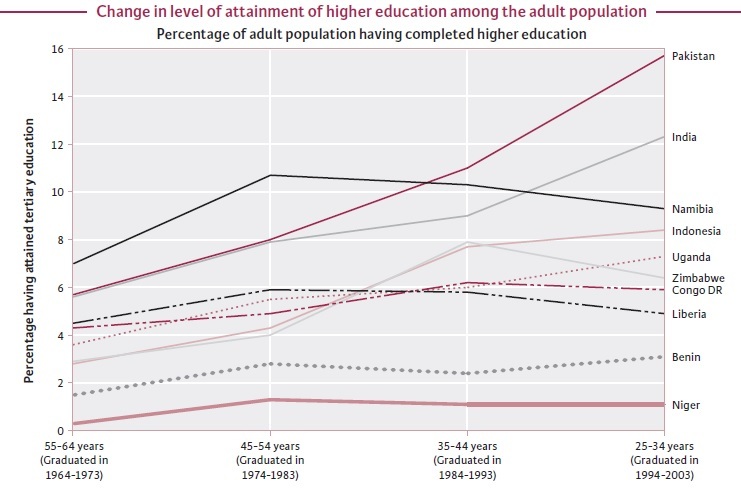 It shows that the percentage of Pakistanis who have completed tertiary education has more than doubled in the last 20 years, growing from 1.7% in 1990 to 3.9% in 2010. ^^RH: "A good indicator is the work of Barro & Lee. 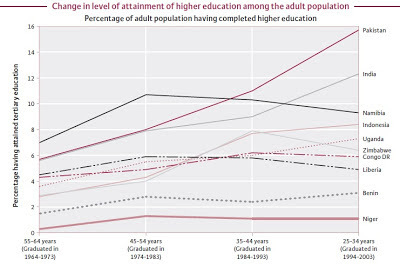 It shows that the percentage of Pakistanis who have completed tertiary education has more than doubled in the last 20 years, growing from 1.7% in 1990 to 3.9% in 2010." QUOTE: "A recent public opinion poll revealed that the top-most research priority areas identified by Pakistanis included ...Urdu literature, Islamic studies, Arabic......"
The German Consulate in Karachi is going to initiate the “Dual Training” system which is an internationally recognised concept related to vocational training and based on German skills of development. Under the Germany-Pakistan Training Initiative (GPATI), this scheme would now be modified and developed into an appropriate model of cooperative training in Pakistan. The training was demand-driven and focused on the development of an employable and highly skilled workforce. In collaboration with employers, such as BASF, Dewan Motors/BMW, DHL, Linde, Lufthansa Cargo, Merck, METRO, Schenker, Shanawaz/Daimler and Siemens and Vocational Training Institutes (VTIs) such as AMANTECH and iACT, this pilot scheme would now be implemented in Karachi. The VTIs would develop programmes according to the need of the employees and the employers would ensure the provision of technical/practical training under normal work conditions. The Deutsche Gesellschaft für Internationale Zusammenarbeit (GIZ) GmbH, a federal enterprise, supported the German government in achieving its objectives in the field of international cooperation for sustainable development around the globe. Along with the European Union (EU) and the Embassy of Netherlands, the German Ministry of Economic Development and Technical Cooperation was funding an ambitious TVET Reform Support Programme in Pakistan and had commissioned the GIZ to assist the Government of Pakistan in the implementation thereof. Programme partners included the National Vocational and Technical Training Commission (NAVTTC), the Technical and Vocational Training Authorities (TEVTAs) in provinces and regions, private sector organisations and a large number of other stakeholders. A key theme of the reform programme was to give employers and industry/training experts of the business economy a central role in all aspects of TVET planning and policy development, quality assurance, monitoring and delivery. GPATI united the underlying principles of the reform and was therefore highly significant as it could give valuable input into the implementation of the overall TVET sector reform. Once the pilot phase of GPATI was successful, the long term objective was to scale up this scheme in 2014 under the TVET Reform Support Programme by including other national and multi-national companies and reaching out into other parts of Pakistan. The first project committee meeting of GPATI took place on February 26th this year. Besides presenting the outline of GPATI activities for the current year, the participating companies, training institutes and GIZ signed a Letter of Intent. The event was chaired by Consul General of the Consulate General of the Federal Republic of Germany Dr Tilo Klinner and GIZ Principal Education Advisor Dr Julie Reviere. The idea of the project was to make use of the presence and commitment of large German companies to develop a workable approach to cooperative training (modeled after the German dual training approach). The success of the project would also demonstrate that TVET was intrinsically driven and delivered by industry and had the chance to produce better results in skills development in terms of both quality and relevance. The training was planned to commence in the first quarter of the current year in the following occupational groups: General electric (incl. motor winding), general mechanics (including bench fitting and machining), electronics, process controlling, pharmaceutical technician, motor vehicle service mechanic, customer service, supply chain, sales and operations. All courses would be complemented by “Life Skills”, “Computer Literacy” and “English Language” learning modules. A lack of strategic vision in the military alignment between India and the US is likely to ensure that New Delhi fails to emerge as Washington's key security ally in the Indo-Pacific region, a former Chinese diplomat to India has said. of China in Kolkata in the late 2000s, quoting a report indicated that strategic military ties between the US and India failed to evolve as expected after they signed the civil nuclear deal. According to a "report of the Center for Strategic and International Studies, US-India Military Engagement, authored by an insider at the US Department of Defence, the current situation of the US-India military relations is far from what the US side expects. The report said the US and India lacked a clearly defined strategic vision to focus their military engagement," Mao said at a recent conference. The report said the US and India lacked a "clearly defined strategic vision to focus their military engagement." "The concerns of the Indian side about jeopardising strategic autonomy, along with personnel and budgetary limitations, have led to a further stymieing of deeper military contact," Mao said. As a result, he said India was not likely to emerge as a key provider of security within the Indo-Pacific region any time in the near to midterm future. At last, Pakistan finally took the gutsy decision of handing over the strategically vital Gwadar port to China, ignoring the raised eyebrows from the U.S., India, several western and Gulf countries including Iran. Located at the top of Arabian sea and mouth of Gulf near the strategic Strait of Hormuz, Gwadar port is at the apex of busy trading and oil shipping route and surrounded by a region that houses around two-thirds of the world's oil reserves. Besides Pakistan and China, its natural beneficiaries will be the landlocked, but energy-rich, Central Asian Republics and Afghanistan, for whom it is the nearest warm-water sea port. The project of world-class sea port that could monitor and share bulk of world’s oil trade has always been a temptation for entire world; like the strategic Strait of Hormuz, which has enabled its controller Iran to see eyeball to eyeball with the mighty super power, the U.S. So, Gwadar always remained a prized object inviting all the mighty countries of the world to win it. Before creation of Pakistan, Gwadar was gifted to Sultanate of Oman by its controller, Khan of Kalat (present day district in resources rich Baluchistan province), as part of dowry to his daughter when she married prince of Muscat. Due to its strategic importance, India made several attempts to purchase it, all of which were foiled by Pakistan, and finally purchased it back from Oman in 1958. Tagged with all those multi-billion dollar profit options, Gwadar port will now being operated by China, against a vehement resistance by the U.S. Obviously, controlling the huge unfathomable resources of central Asia is perhaps one of the major objectives of the long and the costliest ever military campaign in Afghanistan. Despite all the lip service, none of the western countries has ever been willing to give any substantial help to Pakistan which could enable this nuclear power grow into a strong economic regional power. China’s 60 percent oil comes from Gulf by ships traveling over 16,000 kilometers in two to three months, confronting pirates, bad weather, political rivals and other risks up to its only commercial port, Shanghai. Gwadar will reduce the distance to mere 2500 kilometers and also serve round the year. Besides China, Gwadar will be a much cheaper alternative to the traders of Europe, Japan, the Far East, and Central Asia, who could use the under-construction airport to air-lift their good from here, saving over half of the costs and time. But from the phase of construction to operating, China has given up two subsidiary projects which were part of original Gwadar port. Beijing refused to build the oil refinery at Gwadar, and to review the Pakistan-Iran gas pipeline through its economic experts. Nevertheless, Pakistan made “significant progress” this year in shape of commissioning IP gas pipeline and Gwadar port projects despite world's sanctions on Iran. How will the U.S. respond? It is the key question on which the regional politics in near future will rest. Both these decisions are being termed as historic and a feather in the cap of otherwise the ever-notorious president of Pakistan, Asif Ali Zardari who is also practically controlling the affairs of the ruling PPP. He made those toughest decisions at the tail-end of his party’s five-year rule, leaving the consequences to be faced by the next government. KARACHI: Nuclear power will continue to play its due role in meeting energy demand all over the world because of its technical and economic merits. This was stated by Strategic Plans Division (SPD) Director General Lt Gen (r) Khalid Ahmed Kidwai while addressing the 12th convocation ceremony of Karachi Institute of Power Engineering (KINPOE), as chief guest where 65 graduates of the MS (Nuclear Power Engineering) were conferred degrees by Pakistan Institute of Engineering and Applied Sciences (PIEAS). He emphasised that the use of science and technology for achieving better living standards and general comfort for the masses, is not an easy task by any means. Kidwai said that Pakistan Atomic Energy Commission (PAEC) is serving the country and its people in many ways. It also bears the ultimate responsibility for the implementation of nuclear power programme of the country. The commission’s power generation programme remains one of its most important commitments. This objective cannot be achieved by the procurement of equipment and hardware alone. It is critically dependent upon the availability of sufficient number of personnel having the necessary qualification and competence, he added. He appreciated the efforts of the faculty and staff of KINPOE in promoting education and training in nuclear technology and added that technical education of high quality is only weapon to combat the future challenges. In his welcome address, PAEC Chairman Dr Ansar Parvez said that education and manpower training in the field of nuclear technology has always been a prime consideration within PAEC, in the field where the doors of the outside world are no longer open for us. Self-reliance in the training and education is not just important for us but it is absolutely essential. Earlier, in his introductory remarks KINPOE Director Dr Zafar Mahmood said that KINPOE is a part of an organisation which strongly believes that nations deficient in technological development cannot survive in this world. He advised the graduating class to continue hard work and pursuit of knowledge with greater zeal and contribute more enthusiastically for nation building. The Congressional Research Service (CRS), an independent research wing of the US Congress, figures that Pakistan has between 90 to 110 nuclear warheads. “Islamabad is producing fissile material, adding to related production facilities, and deploying additional delivery vehicles. These steps could enable Pakistan to undertake both quantitative and qualitative improvements to its nuclear arsenal,” the recently released CRS report noted. India currently has approximately 60-80 nuclear weapons, it added. “Whether and to what extent Pakistan’s current expansion of its nuclear weapons-related facilities is a response to the 2008 US-India nuclear cooperation agreement is unclear. Islamabad does not have a public, detailed nuclear doctrine, but its ‘minimum credible deterrent’ is widely regarded as designed to dissuade India from taking military action against Pakistan,” the report noted. The Chinese at the meeting urged Pakistan to keep the deal secret to avoid expected international opposition by states that say the sale violates China’s commitment to the Nuclear Suppliers Group, a 46-member association aimed at preventing the spread of nuclear weapons. China agreed in 2004 not to sell additional reactors to Pakistan’s Chashma nuclear facility beyond the two reactors that began operating in 2000 and 2011. However, Hong denied the sale violates the voluntary NSG guidelines. However, U.S. intelligence officials said the China National Nuclear Corp. (CNNC) is Beijing’s main nuclear weapons producer and is working to modernize Pakistan’s nuclear arsenal in addition to the civilian reactor construction at Chashma. Realizing the importance of fusion and the worldwide effort in this regard, Pakistan has launched a National Tokamak Fusion Program to develop human resource and capacity building. Under this program, the Government of Pakistan plans to install a small tokamak (like HT-6M of Hefei , China ) along with various accessories and diagnostics so as to acquire the basic scientific knowledge and the technical know-how of the fusion technology. A recent UNESCO report shows that Pakistan had 162 science and tech researchers per million people in 2009, a 2X increase from from 80 in 2005. By contrast India had 152 S&T researchers per million inhabitants in 2009, up from 136 in 2005. Our class was recently asked whether or not we felt particle physics research should receive public funding. The majority of us were opposed, our reasons being that such research has no practical value. An instrument as sophisticated and expensive as a particle collider is surely a waste of a nation’s resources. So it might come as a surprise that plans to build a synchrotron particle collider in Jordan have received overwhelming support from countries in the Middle East, including Iran, Pakistan, the Palestinian Authority and Israel. Scientific discovery is not the only goal being pursued. Those involved hope that this installation, appropriately dubbed SESAME (for Synchrotron-Light for Experimental Science and Applications in the Middle East), will open lines of communication between countries that would not normally work together, and possibly inspire peace. This idea inspired Stanford University physicist Herman Winick more than a decade ago to suggest the synchrotron being dismantled in Germany be sent to the Middle East instead of being scrapped. In the same way that the boys in Sherif’s experiment could only rent a movie if everyone contributed money, a project as expensive as SESAME can only be achieved with funding from multiple countries. As of 2012, Iran, Israel, Jordan and Turkey have agreed to make contributions of $5 million each to fund the project, which will be based in Jordan and is expected to open in 2015. Pakistan and the Palestinian Authority are willing to give $5 million and $2 million respectively, and Egypt and the United States are both considering making contributions. The project has also been donated spare parts from a number of countries following Germany’s example, and has received funding from the European Union (Science Diplomacy). NEW DELHI: India will retaliate massively even if Pakistan uses tactical nuclear weapons against it. With Pakistan developing "tactical" nuclear warheads, that is, miniaturizing its weapons to be carried on short-range missiles, India will protect its security interests by retaliating to a "smaller" tactical attack in exactly the same manner as it would respond to a "big" strategic attack. There have been significant shifts in Pakistan's nuclear posture recently. First is the movement from uranium to a newer generation of plutonium weapons, which has enabled Pakistan to increase the number of weapons, outstripping India in weapons and fissile material production. Although they are still to be verified, Pakistan has claimed it has miniaturized nuclear weapons to be used on cruise missiles and other short-range missiles. The newer generation of Pakistan's weapons are also solid-fuelled rather than liquid, making them easier to transport and launch. There are many, including Nawaz Sharif and Benazir Bhutto, who have claimed credit for Pak nuclear program. Among the scientists, Prof Rafi Chaudhry and Dr. Ishrat Husain Usmani, both graduates of Aligarh University who later studied in England under Nobel Laureates, were the fathers of nuclear technology in Pakistan in 1950s and 1960s. Then came Dr. Munir Ahmad Khan and Dr. A.Q. Khan who took it to fruition. Among the political and military leaders, Zulfikar Ali Bhutto started the nuclear weapons program in 1970s and Zia ul Haq continued to support it in 1980s. After Zia's death, it was Ghulam Ishaq Khan who took care of it and then passed it on the military when he resigned in 1990s. So ZAB, Zia, GIK and Pakistan Army all deserve credit for it. The policy of a nation, Napoleon once quipped, can be read in its geography. For much of human history, the verity of such an assertion would have appeared self-evident. After all, what is geostrategy if not a state’s chosen response to a preexisting spatial reality? For many thinkers of the early modern era, a country’s geographical position shaped its strategic behavior, whether in times of peace or war. Maritime powers, some have noted, appear both more democratic and inclined to pursue alliances than their territorially obsessed continental counterparts. Amidst the swirling tides of global geopolitics, geography formed a key fundamental — an enduring physical truth — providing a degree of structure and continuity to otherwise arcane national strategies. The dawn of the nuclear age, however, greatly eroded the importance attached to the study of maps. Nuclear weapons, with their terrifying and seemingly indiscriminate power for destruction, seemed to render cartographic musings somewhat irrelevant. In an era where the devastating effects of a single bomb could extend over land and sea, casting their radioactive shadow over bustling cities and sleepy hamlets alike; what did it matter whether a nation was urban or rural, maritime or continental? ISLAMABAD: The Pakistan Science Club (PSC) has launched beta version of Pakistan’s first science, technology, innovation and educational television, Techtv.pk, which will be fully functional by August 14. Pakistan PSC President Abdul Rauf told APP that with the launch of this channel, people would be able to access significant amounts of information with reference to any topic in a short time through different programmes. He said today television has become an important part of people’s life as a source of information, entertainment, a great tool for learning and education, and communications. Many different programme genres have been used to address diverse audiences for a variety of formal and non-formal learning purposes with scientifically measured results, he said. Abdul Rauf said the channel would air educational programmes in all subjects, including physics, chemistry, mathematics, biology and zoology, offering an excellent opportunity for young people to learn. “In remote villages, it will help spread education to willing students through distance learning. Educational television will educate masses on hygiene, literacy, childcare and farming methods or on any topic related to day to day happenings,” he said. PSC President said Techtv.pk would cover all events from Pakistan related to science and technology and educational activities. It will also offer free online courses of web application development, DIY (do it yourself) projects, project management and other science and technology topics. He said Techtv.pk also has an entertainment category with science fiction movies, cartoons and science entertainment programmes. The channel will cover science and technology educational activities in addition to popularising the subjects through disseminating the relevant information and latest progress to students and common people. Rauf said this television channel can prove to be very useful, easy to access at anytime from anywhere and users can access a significant amount of information with reference to any topic in a short time regardless of geographic barriers, allowing them to consult different points of view as well as hands-on experience through different DIY (do it yourself) projects. The channel will use interactive and innovative programmes for this purpose that cover topics of science, chemistry, physics, education, technology, DIY projects, e-learning, documentaries, news, interviews, events, experiments and entertainment. “The main objective of this web TV is to promote scientific culture and the youth’s interest in science, technology and innovations. The channel would also popularise science for laymen and students, seeking to cultivate the spirit of scientific inquiry and the love of learning in its audience,” said Abdul Rauf. Pakistan is acquiring two large nuclear power reactors from longtime ally China, officials said, in a $9.1 billion deal that has raised concern in Washington that Beijing is overstepping international rules on transferring nuclear technology. For Islamabad, the pact with China counters the nuclear energy accord New Delhi signed with the U.S. under then-President George W. Bush. Pakistan regards that arrangement as providing India with an unfair potential strategic advantage for nuclear weapons. Both countries possess a nuclear arsenal. There is unease in the U.S. and elsewhere over the security of sensitive facilities in Pakistan, where Islamist militants have shown they can attack even the most heavily guarded installations, analysts said. There is also concern the Chinese are willing to circumvent rules locking out countries from nuclear trade if, like Pakistan, they aren't part of to the nonproliferation treaty. Pakistani officials haven't talked publicly about this latest agreement, which was quietly signed around midyear and closed in early July. The reactors covered by the deal would be technologically advanced and built outside the main port city of Karachi. They each would provide 1,000 megawatts of electricity, a big boost for power-starved Pakistan. "Every country has this. We are also entitled," the senior official said. "We have to focus on adding cheaper energy supply." China would deliver the first reactor in 70 to 80 months, with the second coming 10 months later. Nuclear reactors take several years to build. They would be installed on the Karachi coast close to a small existing reactor, the senior Pakistani official said. The Chinese will provide 82% of the financing through a loan on what another Pakistani official described as very soft terms. With the 2005 U.S.-India Civil Nuclear Agreement India, which also isn't part of the nonproliferation treaty, won an NSG exemption to buy nuclear power technology. But legal complications have subsequently stalled the anticipated sale of American nuclear plants to India. These obstacles include the liability for compensation for accidents that now exists under Indian law, following the deadly 1984 accident at a chemical plant owned by Union Carbide, a U.S. company, in the Indian city of Bhopal. But Pakistan has objected to the pact. Still, Pakistan, which is in a nuclear arms race with India says that accord was discriminatory. "The U.S.-India nuclear deal was very disturbing for the strategic stability of this region," said Sarwar Naqvi, a former Pakistani ambassador to the IAEA. "It put Pakistan at a disadvantage. It freed Indian uranium to be diverted to their military program." Carnegie Endowment's Mr. Hibbs said that the design of the new 1,000-megawatt reactors that Pakistan will receive is untested, even in China. He added that the price tag doesn't suggest that Islamabad is getting any "bargain." There wasn't competitive bidding on the project. As part of his speech to the United Nations General Assembly last month, Prime Minister Sharif called for Pakistan to be allowed to join the Nuclear Suppliers Group. "Pakistan qualifies for full access to civil nuclear technology for peaceful purposes, to meet its growing energy needs," Mr. Sharif said. KARACHI - First time in the history of country, Latif Ebrahim Jamal National Science Information Center (LEJNSIC), Karachi University (KU), is going to start an open learning program, named ‘LEJ Knowledge HUB’, in Pakistan and globally as well. These views were expressed by former HEC chairman Prof Attaur Rahman while speaking at a press conference at Karachi Press Club on Friday. “Pakistan is now among the first in the world to initiate a learning platform which includes integrated courses from various major world sources for ready accessibility, structured mentoring and assessment system,” he added. He said the programme has potential to change the entire landscape of higher education in Pakistan and the developing world. Chairman Husein Ebrahim Jamal Foundation Mr Aziz Latif Jamal and Director International Center for Chemical, Biological Sciences (ICCBS-KU) Prof Iqbal Chaudhary were also present on the occasion. Prof Attaur Rahman said that the vision of the program was to provide an interface for the researchers and reputed institutions from around the world to collaborate, share and enhance their knowledge. An easily accessible treasure chest of unending information is being made available to students, faculty and researchers alike, he maintained. The entire programme is led by our most celebrated scientist and global leader in education, Prof Dr. Atta-ur-Rahman as a monumental service to the nation and the world at large. Talking about his federal minister ship, he said that the first major steps to enter into the new IT age were taken in Pakistan when I (Prof Atta) was the Federal Minister of Science & Technology in 2000-2002. “Internet access was confined to only 29 cities till early 2,000. It was rapidly expanded to cover 2,000 cities, towns and villages during the next two years. Fiber was expanded from 40 cities to over a 1000 cities and towns. Bandwidth had been priced ridiculously high till then ---$ 87,000 per month for a 2 MB line per month. The rapid improvements in the IT infra-structure allowed me later as Chairman Higher Education Commission to use them for the benefit of the higher education sector,” he held. “In the year 2001, a satellite was placed in space (PakSat 1) and a couple of transponders were set aside for distance learning courses of the Virtual University that we established in Lahore. Today the Virtual University provides quality education to over 100,000 students and has teaching programs across Pakistan and abroad,” he maintained. Aziz Latif Jamal said: “LatifEbrahim Jamal National Science Information Center (LEJNSIC) has been serving as a hub of information dissemination and focal center of the Virtual Education Project Pakistan (VEPP) since 2008, led and supervised by Attaur Rahman and Prof Iqbal Choudhary. Talking about the significance of the Asian Symposium, Prof Iqbal Choudhary said that a special session is dedicated to commemorate the 50th anniversary of the ASOMPS, which started in 1960 from Peshawar (Pakistan). Moreover, some plenary and keynote lectures will be also arranged through video conferencing. ISLAMABAD: Despite facing various kinds of embargoes to obtain nuclear equipment, Pakistan will continue to develop its civil nuclear capability in a bid to diversify its energy mix and overcome power crisis, an official said. Pakistan’s nuclear installations are safe from terrorist attacks as the outer container installed at the nuclear power plants can save them in case of missile attack or even hitting an aero plane similar to that of 9/11 attack on the twin towers in the US. “Pakistan’s situation is quite different from that of India, as the Nuclear Supply Group has not imposed restrictions on them and even Australia is providing them uranium. We are hopeful that embargoes imposed on us for getting uranium will be lifted down the line over the next five to 10 years,” Pakistan Atomic Energy Commission (PAEC) Chairman Dr Ansar Parvez said, while briefing reporters on the occasion of media workshop organised by the PAEC on Saturday. In the concluding daylong workshop, the PAEC chairman said that Pakistan is facing various kinds of embargoes but the government has given its indication that whatever would be possible it would be done to install 42,000MW through nuclear power plants till 2050. The PAEC chairman said that he was quite optimistic that time will come down the line in the next five to 10 years after lifting of embargoes on Pakistan. To another question about the possibility of seeking civil nuclear cooperation from the US as it did in the case of India, Dr Parvez said that there is no commercial agreement signed between the US and India. About the cost of nuclear power plants, he said that the nuclear energy plant costs around $4 million per megawatt that was not cheaper but in the long run, the energy generated through these plants costs cheaper as compared to other sources such as fuel and wind. Despite all difficulties, Pakistan is continuing its nuclear energy programme with the help of China, he said, adding that three nuclear plants are already working in the country and two other are near completion. Nuclear energy, he said, is important for Pakistan due to its sustainability and low generation cost. In the near future, PAEC is going to start building two more plants in Karachi with 2,200MW generation capacity, which are likely to be completed in 2021. Dr Inam Ur Rehman, who is among the pioneers of the country’s nuclear programme, said that Pakistan developed the required human resource and now capable to run its programme without the help of anyone. The scientists of the PAEC briefed about the safety measures and said that there is no safety issues with the nuclear plants in Pakistan and they are built keeping in view the extreme circumstances. Pakistan, they said, is now using third generation nuclear equipment and that is 500 times safer as compared to the equipment installed in Fukushima and Chernobyl where nuclear accidents took place. But, they said, that even in the case of Chernobyl and Fukushima no mass killing was observed. Nuclear energy generation plants are not that dangerous at all, as they are perceived and all the international research reports deny that a mass killing took place after an accident in any nuclear energy generation plant. There was no chance of leakage of radiation from these plants in any circumstances, they said. The speakers also said that there are around 71 nuclear plants under-construction worldwide having almost 70,000 megawatts generation capacity. I am eagerly awaiting the first runs of my new book, ‘Overcoming Pakistan’s Nuclear Dangers’. Publication comes one year and three-quarters after conception. They’ve been laborious months. It has long been rumored that the Saudis expect the Pakistanis will help them to acquire an arsenal. However, Pakistan has of late asserted its independence from Saudi Arabia, as evidenced by their refusal to aid Saudi Arabia’s war in Yemen. Such a move would exacerbate tensions not only between Islamabad and Washington, but Riyadh and Washington as well. If Pakistan is not willing to provide sensitive nuclear assistance to Saudi Arabia, Riyadh will have to pursue it on its own. The Kingdom of Saudi Arabia has an extremely limited nuclear infrastructure. It does not even possess a research reactor and only obtained small quantities of nuclear material through the IAEA. It has plans for building up to 16 reactors, but the first will not go online until (at least) 2022. The Saudis have also signed an agreement to purchase American-designed reactors from South Korea. The U.S. maintains that if such reactors were to be sold, KSA would have to sign what is known as a “123 agreement” that would shut down domestic enrichment and reprocessing. Given its weight in international oil markets, the Saudis could call the Americans’ bluff and enrich anyway. However, this would be a tremendous gamble that would likely jeopardize U.S. security guarantees. China on Wednesday agreed to invest $1.5 billion to set up Pakistan-China Science Park in Islamabad. Minister for Science and Technology Rana Tanvir Hussain - who is on a visit to China - signed a memorandum of understanding (MoU) with his Chinese counterpart UN Urmaqi. He also invited the Chinese investers to visit Islamabad in next month to select location for construction of the Park by March 2016. He expressed his gratitude for huge investment in Pakistan. The minister said that Pakistan and China had a lot to share with each other in term of technology, expertise and business. “We are looking to strengthen our mutual ties on economic as well as technological fronts,” he said, adding that this project would prove to be a link of the China-Pakistan Economic Corridor (CPEC). It would bring prosperity to the people of both sides. "We were able and we had a plan to launch nuclear test in 1984 but then President General Zia had opposed the move," Dawn quoted the father of Pakistan's nuclear programme as saying. Pakistan had the ability and had planned to conduct a nuclear test in 1984, said scientist Abdul Qadeer Khan. However, Gen. Zia opposed the idea as it would have curtailed international aid Pakistan was receiving due to the ongoing Soviet occupation of Afghanistan, he added. General Zia was of the opinion that the world would stop military aid if Pakistan opted for the nuclear test, Khan added. He also said that Pakistan was able to target New Dehli from Kahuta, a city in Pakistan's Punjab, in five minutes. "Without my services Pakistan would never have been the first Muslim nuclear nation. We were able to achieve the capability under very tough circumstances, but we did it," said Khan while addressing a gathering on the occasion of Youm-i-Takbeer(the day Pakistan became a nuclear power state). Referring to the treatment meted out to him during Musharraf's era, Khan said nuclear scientists in the country have not been given the respect that they deserve. "We are facing the worst against our services to the country's nuclear programme," he added. Abdul Qadeer Khan was at the centre of a massive global nuclear proliferation scandal in 2004. In a series of dramatic developments, he was accused by then army chief and president Pervez Musharraf of running a rogue proliferation network for nuclear material. Shortly after Musharraf's announcement, a recorded confession by Khan was aired in which he took sole responsibility for all the nuclear proliferation that had been revealed. Adita Joshi writes on how the indelible ink, used to identify voters, was first developed by Dr Salimuzzaman Siddiqui, way back in the 1940s for the CSIR in Calcutta. (On an aside, it is worth noting here that after he moved to Pakistan in 1951, he became the father of modern science and technology of that nation, establishing the Pakistan Academy of Sciences, Pakistan CSIR, Pakistan Atomic Energy Commission and others. He was thus Colonial India’s gift to Pakistan). Seventy-two years ago, colonial empires collapsed, and close to 80 countries across Africa, Asia and Latin America became free nations. And each new nation had to plan for its future. Yet, among these 80, India was the lone nation that “made friends with science” as a policy for development. No other nation did so; it was unique and far-reaching! Our first Prime Minister, Pandit Jawaharlal Nehru declared: “The future belongs to science and those who make friends with science.” For our growth and welfare as an independent, democratic nation, we chose science and technology as major instruments. A gallery of distinguished and patriotic scientists, technologists and thinkers were approached for advice, and their advice heeded. Within a decade of independence, our food production tripled; small pox was eradicated; harmonious sharing of the five Indus rivers with Pakistan was agreed upon; dams and waterways was built and five IITs, two agricultural universities and one AIIMS were set up. (Readers will surely add more). We reap the benefits of their advice to this day and have added more. What if we hadn’t? Was India prepared for this daring initiative? As it turns out, modern (Baconian) science had already taken root in Colonial India since the mid 1700s. (In a forthcoming issue of the journal Indian Journal of History of Science, stories of about 35 successful Indian practitioners of ‘Western Science’ in colonial India will be highlighted). And many of its distinguished practitioners and their students were Indians in India. It was the meeting of minds of these scholars and the political leaders that made India modern. It is now 70 years since Independence. How well has the practice of science transformed India? It is on this theme that the Indian National Science Academy (INSA) has come out with the book: “Indian Science: Transforming India — A look back on its 70-year journey; impact of science in independent India”. It has 11 stories, written in a lucid and non-jargonian fashion by Drs. Adita Joshi (biologist and educator), Dinesh Sharma (journalist and science writer), Kavita Tiwari (biotechnologist and writer) and Nissy Nevil (physicist and science policy consultant). These articles showcase how: (i) modern science is the key; (ii) large scale applications are possible which can transform the economy of a nation; (iii) community participation is vital for understanding, acceptance and practice, (iv) a sense of daring or challenging existing mores is important and (v) how a ready adaptation of ‘modern biology’, and its use for general welfare is appreciated even by rural populations. How did migration impact the professional networks in which scientists functioned? Did they continue academic discussions with their former colleagues on the other side of the border? Consider the career of the chemist Salimuzzaman Siddiqui. Born near Lucknow in 1897, Siddiqui studied at the Mohammedan Anglo-Oriental College (the forerunner of Aligarh Muslim University), learnt painting under Rabindranath Tagore in Calcutta and did his doctoral research in Frankfurt. Returning to India, he conducted pioneering research on Rauwolfina serpentina and other indigenous plants with medicinal properties at the Unani Tibbia and Ayurvedic College in Delhi. He then caught the eye of scientist and technocrat S.S. Bhatnagar, the chief architect of the network of labs set up under India’s Council of Scientific and Industrial Research (CSIR). In 1947 he was made director of the National Chemical Laboratory (NCL). But religious tensions in post-Partition Delhi made daily life hazardous for Siddiqui. Issues were complicated further by the fact that his brother, the prominent Muslim League leader Chaudhry Khaliquzzaman, was now in Pakistan. This probably made Siddiqui a less palatable choice politically, and the offer of the directorship of NCL was withdrawn. Nevertheless, he continued work in Delhi until 1951, when he left for Pakistan at the invitation of Liaquat Ali Khan and became head of Pakistan’s CSIR. Similarly, the name of Nazir Ahmed, a scientist who had done his PhD in physics in the Rutherford-led Cavendish Lab in Cambridge in the 1920s, is not widely known in India. Inevitably, given the fact that he went on to head the Pakistan Atomic Energy Commission, he is remembered primarily as a Pakistani scientist. But before that, he had had an (enduring) impact on science in undivided India. In the years after his return from England, Ahmed taught physics in Lahore, carried out research on cotton in Bombay, visited nuclear facilities in Allied countries along with eminent scientists and institution-builders Meghnad Saha and Bhatnagar towards the end of World War II, and played an important role in conceptualising the (Indian) CSIR. Nor was the reverse scenario uncommon. Shanti Swarup Bhatnagar (1894-1955), mentioned twice above, was renowned not only for his leadership of the CSIR in the 1940s and 1950s but also for his research in colloidal and magnetochemistry. His too was a career built on either side of Partition (both in time and space). Bhatnagar’s formative years were spent in Lahore, where he got his high school and university-level education (at the Dyal Singh College and the Forman Christian College respectively). After a doctorate in London, he taught and conducted research for several years at the Punjab University in Lahore before he began his career as a technocrat in Delhi. A product of the syncretic Ganga-Jamuni tehzeeb, he wrote the official song of the Benaras Hindu University (where he worked briefly) in Sanskritised Hindi. But it was his literary talent in and mastery of Urdu that attracted attention when he was a student. When his wife died in 1946, he produced a collection of Urdu poems in her memory. When Partition occurred, Bhatnagar stayed on in India, where his career graph was soaring, leaving behind friends, former students and a grand home in Lahore. An operation by the Mossad earlier this year to steal files relating to Iran's nuclear program was conducted on January 31, according to a report by the New York Times. Mossad operatives broke into a warehouse in an industrial area in Tehran and, according to the report, had six hours and 29 minutes to finish the job before the morning shift arrived at 7 A.M. During this limited time, they disabled the alarms, broke through two doors, burned open dozens of safes and fled the city with the documents. The agents were carrying blowtorches that burned at some 2,000 degrees Celsius to cut through the safes, according to the Times,. The report suggests that Israel may have had help on the inside, since it says that the Mossad agents knew exactly which safes to break into – leaving many of the others untouched. At the end of the night, the agents fled with half a ton of secret materials, including 50,000 pages and 163 compact discs containing files, videos and plans. The Iranians began storing the files at the warehouse after signing a landmark 2015 accord on its nuclear program with the United States, European powers, Russia and China. The deal gave the UN nuclear watchdog access to suspected nuclear sites in Iran. Israel claims that after signing the agreement, the Iranian regime collected files from across the country about the nuclear program, storing them at the warehouse. The warehouse wasn't guarded around the clock so as to not arouse suspicion. The report was based on briefings Israel gave Western media outlets last week and included details from the stolem documents, which were presented in April by Prime Minister Benjamin Netanyahu in a prime time address. The report further stated that Israeli officials said Tehran received help for its nuclear program from Pakistan and from other foreign experts. Another report, from the Washington Post, says that Iran was on the verge of acquiring "key bombmaking technologies" when the program, code-named Project Amad, was halted some 15 years ago.